All over the world, people are coerced, criminalized and discriminated against, simply for making choices about their bodies and their lives. We all have the right to make decisions about our own health, body, sexuality and reproductive life, without fear, coercion, violence or discrimination. Amnesty International’s is campaigning to stop the control and criminalization of sexuality and reproduction by governments and others. In the historic referendum on May 25th, the people of Ireland voted overwhelmingly (66.4%) to repeal the Eighth Amendment, removing Ireland’s near-total constitutional ban on abortion. This outcome was only possible because of your involvement and your activism. Our country listened to women and is changing both the constitution and the law. Now we need your help once more. This fight isn’t over yet. We still need to ensure the government delivers on its promise to ensure real access to abortion which respects the human rights and autonomy of women and girls. Additionally, movements across the world who are working to advance sexual and reproductive rights, need our solidarity and support. By joining the It’s Time Movement, you will be kept up to date on developments in the global campaign for sexual and reproductive rights, and information on how you can get involved. Amnesty is campaigning to make sure we all have control over our sexual and reproductive choices across the globe. From Argentina to Poland to Northern Ireland, women, girls and pregnant people need your support. 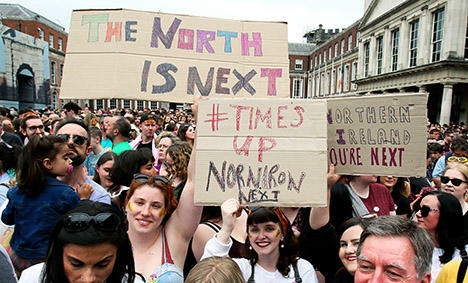 The North is next: Take a stand for women’s rights in Northern Ireland. In our campaigning for abortion law reform in Ireland, we use a mix of terms: ‘women and girls’, ‘women’, ‘pregnant people’, or ‘women, girls and all pregnant people’. This recognises that the majority of those who need access to abortion services are women and girls. It also recognises that not everyone who requires access to abortion services identifies as female. ‘People’ is an inclusive term of women, girls and all those who can become pregnant. Using these varied terms reflects the fact that Amnesty International advocates for the sexual and reproductive rights of all people. Find out more about Jennifer here. Find out more about Fionnuala here. This selection of women’s stories was originally collected for the report She is Not a Criminal: the impact of Ireland’s abortion law, in order to document the myriad human rights violations stemming from Ireland’s restrictive abortion laws.